Can I just say WOW! 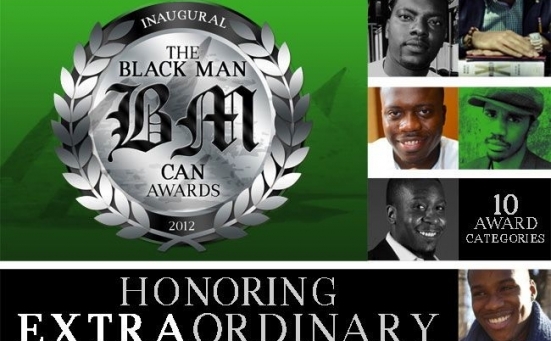 When Brandon Frame, ofTheBlackManCan.org and I sat down in March and decided to launch the Black Man Can awards, I don’t think either of us expected the results and tremendous support. On any given day, on any news channel and in countless media sources the image of a black male portrayed in a negative light can be found. Often these negative portrayals of black males make indelible impacts on how the people of the world view black men and boys. Without a doubt something was needed to counter these negative images and show the world that indeed there are tons of positive black males making contributions to our society everyday. To have hundreds of nominations come over from all of the country and thousands of people voting everyday show that the world wanted to see the Black Man Can Awards. We do indeed support each other and all we are doing to make the world a better place! Recognizing accomplishments within the community and professional arenas, the awards honored black men and boys in 12 categories who embody the definition of a positive black male! Winners of the 2012 BlackManCan (BMC) Awards will receive: an official crystal award trophy, Dove Men’s Care gift basket, Magic Shave gifts,”The Foundation” Collection by Final Frame Ties, Gifts from Men’s Warehouse and bragging rights for one year! I want to personally congratulate every nominee, what each of these men and boys are doing is what should be celebrated everyday! Thanks to everyone that voted and showed your support! Check out the winners below, go here to read all of the nominations! Special thanks to our platform provider Contest.is for tallying our votes and helping us make this happen! Law - Sean Walton, Jr.
Medicine - Dr. Ben Carson M.D.